This is a summary for McKenna from age 5-5.25 (5 and 3 months old). Eating is great. Nothing new or different here. McKenna doesn’t really need naps very often these days, even with it being summer. McKenna played her first soccer season this Spring. I have to be honest. I expected McKenna to be an amazing soccer player. She is strong, athletic, fast, aggressive, and competative. She has also watched soccer for her entire life, so I though she would run out there and no just what to do. She has been dying to play for years. Begging to play. She obviously would know just what to do. She was more confused than Brayden or Kaitlyn ever were when they first started playing. She would bust it out and run up along side the opposite team and run right along with them as they dribbled the ball right into the goal. It can be hard to have taught a child for an entire lifetime that they need to be nice, share, take turns, etc. and then throw them onto a field and expect them to naturally go against all of that. By the end of the season, however, she clicked. She understood what she was supposed to do and she did it. She started scoring and started being a defender. At the end of the game, she still said, “Who won?” she never had any idea–even when her team won 9-0 she wondered who won. I love that about her. She is playing hard just for the sake of playing hard and for having fun. McKenna is done with preschool and anxiously waiting to go to school with her brother and sister! It should be exciting! I made a crazy decision this year. In our town, you can play kids up in softball and baseball. It is even highly encouraged to do so. Kaitlyn played t-ball last year, and it was time for her to play softball. I got thinking…I could play McKenna up (way up) and have her be on Kaitlyn’s team. McKenna would be at all of the games anyway, so we might as well have her on the team, right? So I signed her up. Sign-ups were in the late winter, so it was long ago. Along comes Spring. We head on out to the backyard to practice playing catch and hitting the ball. And…I was a lot concerned. McKenna couldn’t catch the ball even if I threw it right to her mit. Her hitting was okay, but her catching was frankly terrible. I figured there was a good chance she hadn’t developed depth perception yet and was too young. I went in the house and called the woman over softball and told her McKenna was terrible and I needed to pull her and put her in T-Ball instead. She said that was fine, but she assured me she would really be fine to stay in softball, too. I decided to listen to her and kept her in softball. I am glad I did! She did awesome. Now, she wasn’t the star of the team or anything like that, but she wasn’t totally terrible, either. She offered a whole lot of comic relief in those early games. For example, she would slowly jog to her base. Or she would get to her base and stop right in front of it and not touch it. Or she would get to it, touch it, and then step off with the baseman holding the ball. Or she would be running home and stop about midway between third and home and head over to the dug-out. She is tall, but her head is tiny and no helmet ever fit her so she was always at bat with a helmet blocking her vision. Here is the thing, though, is she never got out by the other team (she did strike out a few times). The other teams didn’t get the game well enough yet to get her out. There were girls up to Brayden’s age on her team. The great thing about McKenna is that she is so unaware that she didn’t even realize that she should feel nervous around these girls. She would go stick herself in the middle of their conversation and talk to them. They were always very sweet to her. 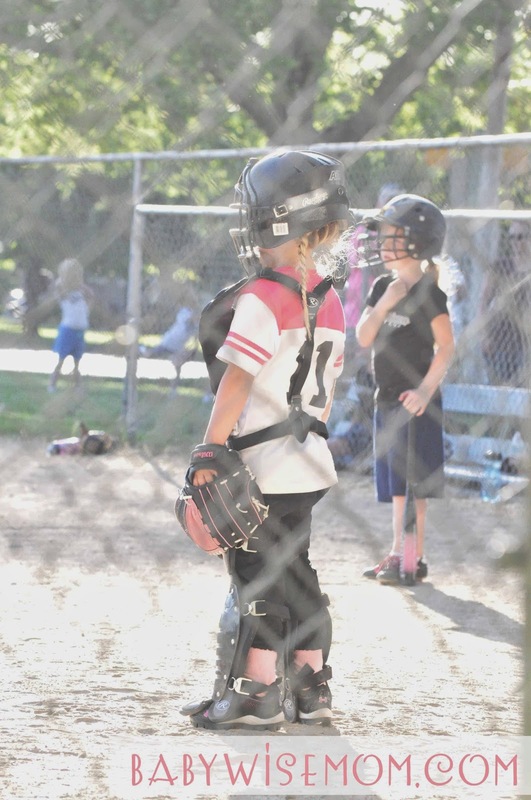 She also loved playing catcher (where she spent a ton of time talking to the umpire, because McKenna makes fast friends with whomever is around her). She improved a lot. If it had been baseball, it wouldn’t have been good. Baseball here is a TON more intense than softball. But softball turned out to be glorified T-ball, so it was great. Oh my goodness! What a change here! We have had issues for about a year. It has been a roller coaster. We have tried incentives, leaving her there with her teacher without us, and just not allowing her to even go to swimming lessons while the other kids went. You might remember that last time I said she had ear tubes and I hoped getting those out would help her with swimming lessons because she complained about water rushing in her ears. She got her tubes out in May and wow! What a difference! She is passing stuff off like crazy. She is just busting through lessons and loving it. What is the take away from this? If you have a child with ear tubes, I would definitely get him/her fitted for ear plugs so swimming can be okay. Also, if you have a child with tubes who is having a rough time with swimming lessons, just wait until the tubes are out and conquer lessons then. McKenna got her tubes out in May. It was so very funny. I had talked with her extensively before going in about how she needed to hold still and be brave. I told her it might hurt for a bit but if she moved, she would cause long-term problems in her ears so she needed to just hold still. So we went in ready for that. They gave her some medicine to make her calm–I can’t remember what it is called but it is very common. They thought it would basically put her to sleep, but she just got so she was bit wobbly. She would kind of tip over a bit. She was quite amusing. She got the hiccups. She was very calm and giggly. They took her into the exam room and swaddled her up. They then put her on the exam room and a nurse literally straddled her on the table to hold her down. They must have some crazy experiences if they feel the need to medicate, swaddle, and straddle. McKenna just chit-chatted and laughed and had a grand time. The doctor and nurses were all just loving her. Apparently usually kids are okay for the first tube coming out and then flip out after and they have to really wrestle them to get the second one out. McKenna held perfectly still for both. She also held perfectly still for her paper patches to be put on. Let’s be real, the girl just had her face stitched up with no medication to placate her last December. She held perfectly still then. A little ear tube was not going to phase her. Her ENT said afterward that she definitely didn’t need the medicine, but that you never really know beforehand. After they were done, they gave her a sucker. They also gave her a wheel chair ride out of the hospital and I pulled around to get her (I had Brinley with me AND McKenna is as tall as most second grade girls–she is about 1/4 inch shorter than Kaitlyn, so she is a bit bigger than I can carry through the hospital and out into the parking lot). She was very happy and giggly until we got home. We pulled in and she saw her friends outside playing. She hopped out of the car and went running (like a drunkard) to go play. I told her she needed to play inside. I was helping her get downstairs so she could sit and watch TV (I figured she had the best chance of not injuring herself that way). Like I said, I can’t carry her, so I was trying to help her down. She wanted to do it herself but she couldn’t really walk. I suggested she slide down the stairs like Brinley does (and McKenna does about a thousand times a day because she thinks it is fun). She burst into tears and proclaimed that she was not a baby. The nurses had told me she would likely get weepy at some point as the meds wore off. I should not have brought Brinley along. They have always told me that to remove the tubes is a simple procedure so I figured she was going to sit on a stool, he would take them out, and we would be on our way. It was a lot more involved than that. It was simple, but not like your basic check-up simple. I just would have liked to have been able to give 100% focus to McKenna rather than having to split it with Brinley. If I did it over, I would have just had it be the child and me. I could have fought the medication. The hard thing is that you don’t know for sure how your child will react, and you don’t really want to risk damage to the ear drums unnecessarily. If I hadn’t had Brinley, then I would have felt confident that I would have just used myself to calm her down and keep her still, but again, my efforts were divided. It wasn’t a huge deal, she is fine and was fine (and it was very entertaining), but I don’t love medication unless it is necessary. The upside to it is that it makes it so they don’t remember it very well. This is nice if they have a lot of fear or anxiety so they don’t associate that fear and anxiety with the doctor. If you think you will run any errands on your way home, think again! Do your errands before the appointment. You will spend the rest of the day taking it easy. You can’t get in a pool for 2-3 weeks. They want you to keep ears dry as much as possible for as long as possible, so baths are out (we did showers–but had to wait a few days). I would have liked to have known this before deciding when to get the tubes out. I would have done it at a less hot time of year! As they heal, your child will likely experience ear pain. The ears are not used to popping and all of that since they had tubes in them, so your child has to re-learn the art of doing that. I was afraid she was getting an ear infection when she complained of ear pain, but that is apparently normal. At her check-up, her ears had healed perfectly! No scar tissue and no problems. I have decided I really love summer camps–the kind that is a class in the day. I have been wondering if McKenna should move dance studios to be at our local ballet company. The studios here that supposedly do a combo of tap/jazz/ballet, etc. really don’t add much ballet in there. We have a school that is just ballet. They are strict with a dress code and hair code. All music is classical and the kids are taught by real ballerinas who are in real ballets. The discipline of ballet really appeals to me. I think that could be very good for McKenna. So, McKenna did a summer ballet camp with this studio. McKenna totally loved it. I did, too. But she doesn’t like not having variety in her dance time. She loves ballet, but she also loves dancing to music with words, too. So I am not sure what we will do. I am leaning toward just keeping her at the same studio as Kaitlyn. That way, we stick with one recital and one company to deal with. I still need to think on it. McKenna seems to be made to be a ballerina, so I hate to not point her in that direction. But I also don’t want to make life more hectic than it needs to be. Decisions, decisions. A very interesting thing to me is that Kaitlyn and McKenna have had very different intersts in toys all growing up. It actually in some ways is unfortunate because we have a bunch of girl toys already! Kaitlyn has always liked the animals. The My Little Ponies , the stuffed animals , etc. McKenna, however, has always liked the more girly things. The princesses and baby dolls have been her main focus. 7:00 AM Wake up, get dressed, eat breakfast. Daily chore. 9 AM Go to school. 12 Noon Get home and eat lunch. Free play with Brinley. 1 PM Game time with me.